Black pepper is one of the most commonly used spices in the world, called as black gold by the British. It is something which adds a magical flavour to any food. It is used in different cuisines around the world in both whole and grounded form. 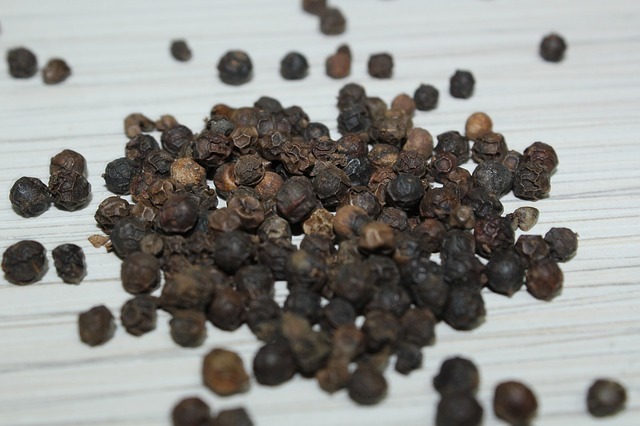 Apart from its strong flavour, black pepper also has a lot of health benefits as it contains a lot of minerals such as potassium, magnesium, iron and vitamins such as vitamin K and vitamin C.
Many of you who consume black pepper might not be aware of the fact that this spice is classified as a medicinal spice and is very rich in mineral content. It has a lot of medicinal benefits. Black pepper aids in digestion. It also helps in relieving cough and common cold and also has got anti-biotic properties. Let us try to understand the various benefits this amazing spice can give for our skin, hair and health through this article. Black pepper is packed with lots of vitamins and minerals that help in improving your health. It consists of essential nutrients such as manganese, potassium, iron and dietary fibres. It also consists of vitamins such as vitamin C and vitamin K. the amazing medicinal benefits of this spice can be attributed to its antibacterial, anti-oxidant, and anti-inflammatory properties. Other than giving cure for cough and cold, black pepper is also in fighting against diseases such as cancer and intestinal problems. Adding black pepper to your daily diet can also help in improving your skin and hair. For those who are looking for a healthy and glowing skin, there is no there is no other thing in your kitchen shelf that could give you as much benefits for your skin like what black pepper does. Let us see the various benefits that it offers for your skin. Dead skins can be removed from your skin by crushing some black pepper and making a scrub to remove it. It will exfoliate the skin and also help in removing toxins from the skin and make it soft and radiant. Its anti inflammatory and antibacterial properties will also help in preventing acne. For those people who suffer from vitiligo skin disease, where they lose pigmentation of skin in some areas and skin turns white, black pepper has been found out as a natural cure. Instead of going for harsh chemical treatments, you can start using black pepper as the piperine found in it is capable of stimulating production of pigmentation of skin. Black pepper has got a lot of antioxidants in it, which makes it helpful in protecting your skin against symptoms of ageing of skin such as dark spots, fine lines and wrinkles. Stop buying expensive creams for your skin and start having black pepper in your daily diet. You will definitely see the results. Black pepper is a good natural remedy for those who suffer from dandruff problem. Mix together a bowl of curd and a teaspoonful of crushed pepper and keep it applied on your scalp for around 30 minutes. Wash it off without using a shampoo. Make sure not to overdo as pepper as excess will lead to scalp burn and extreme discomfort. To revitalise your hair, and make it shiny, lustrous and soft, here is what you should do. Mix a tablespoon of ground black pepper and lemon seeds and apply it on your scalp. Leave it like that for 10 to 15 minutes and then wash it off using cold water. Black pepper is a natural antibiotic. The antibiotic characteristics come from its rich Vitamin C content. The antibiotic property of the spice makes it capable of fighting harmful free radicals. The anti biotic property of the spice is one of the most important uses of it. Black pepper is really good for your dental health. It will improve your dental health by fighting tooth decay and also can give you quick relief from tooth ache. Black pepper is a good cure for all the diseases caused by bacteria and bacterial infections. For treating problems such as constipation, diarrhoea and colic which are caused by bacterial infection, it has been found out that black pepper can have a good influence if used for treating such conditions. Consuming black pepper can help you in easing congestion. It is also found to be useful in treatment of cancer. Black pepper has got this free radicals scavenging property which makes it helpful in treatment of cancer by slowing down the activity of some types of cancer. Black pepper has been found to be helpful especially in treating skin cancer. Black pepper can also help you in fighting and preventing diseases related to the intestine and stomach. Black pepper can ease you digestion process by secreting hydrochloric acid as an alert before food consumption. Hence consumption of black pepper can keep your stomach free from all sorts of digestion related troubles. Consumption of black pepper helps in boosting metabolism in the body. It will help in reducing the belly fat by burning away the unwanted calories. For those suffering from obesity, black pepper can be of great help. Daily consumption of black pepper will help in reducing stomach related problems. Black pepper is a quick remedy for cough and cold. The antibacterial properties of the spice make it useful for treating different types of respiratory disorders. Black pepper has been used as remedy for treating cough and cold since ages. I hope all these are enough reasons for you to make this amazing spice a part of your diet.